James Ross was born in Scotland in 1869. His father, James, was caretaker for an estate in the shire of Aberdeen. At 16, Ross booked passage in the steerage of a ship to Canada, where he stayed with an uncle for six months. He returned for a time to Scotland, then came to the U.S. He worked in Colorado and eventually made his way to Santa Barbara. He never returned to the country of his birth. Ross first worked for area physician Richard Hall as a coachman. He even periodically assisted in emergency surgeries. After Hall’s untimely death from a ruptured appendix, Ross worked as a ranch hand and as a gravedigger for a time at Santa Barbara Cemetery. Ross continued his labors as a ranch hand until 1902. That spring, Santa Barbara mayor George S. Edwards stopped to water his horse at Dos Pueblos Creek. He had a lot on his mind; the chief of police, Daniel Martin, had passed away in February, and Edwards still had not found a replacement. He saw Ross baling hay in a nearby field and, after talking with him awhile, offered him the job of chief of police. Ross readily accepted, and so on his very first day in the Santa Barbara Police Department, he found himself sitting behind the desk of the chief. Ross made a number of improvements to the force. In 1915, he began to require his officers to make full, written reports concerning their cases. Before this, official records consisted of hastily scrawled notes and officers’ powers of recall. The first case to which the new system was applied was a case of theft of underclothes from a backyard clothesline. The small size of the force at times necessitated the chief himself to hit the mean streets of Santa Barbara. In 1914, he had a narrow escape when a suspected safecracker, cornered in a creek bed, threatened to blow them both up with a small vial of nitroglycerin. Ross shot the man in the head, and the vial fell harmlessly to the ground. The safecracker survived to serve time in San Quentin. When the vial was later disposed of, the explosion reportedly blasted a five-foot-deep hole in the ground. 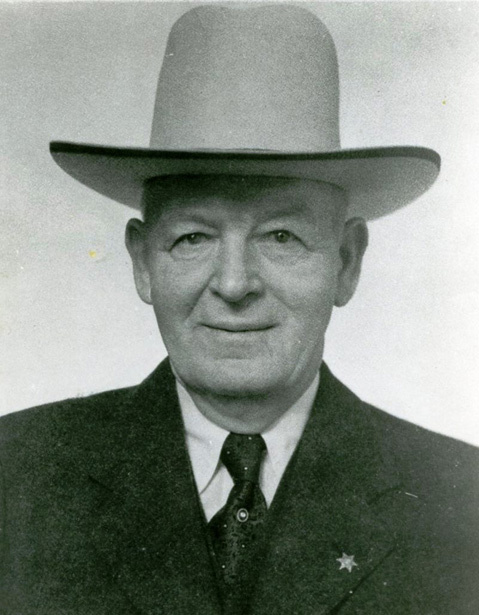 County Sheriff Nat Stewart died in office in 1917, and the Board of Supervisors approved Ross’s selection as sheriff. The electorate would return him seven times to office, until his retirement at the end of 1945. Ross was known for his utter incorruptibility and his humane treatment of prisoners. At times, he would help juvenile offenders find jobs or loan small amounts of money to released prisoners to help them back on their feet. Ross worked hard to eliminate corruption. Prisoners had been fed on a contract basis—a source of graft. Ross shifted that responsibility to the county and tightened accounting procedures. Bootlegging was a major problem during Ross’s early years as sheriff. When Prohibition became the law of the land, Ross, who certainly liked a “touch” now and then, swore off liquor completely and stuck to it. One of his biggest coups was the capture of an oil tanker truck filled with contraband spirits. In 1917, the Sheriff’s Department had a staff of four and one car to police the entire county. Ross, again, often took to the field. He taught himself to drive, and a story made the rounds that he, early on, had a habit of pulling on the steering wheel and yelling, “Whoa!” as the car careened down a hill.